Cottage #9 located in Whispering Pines Resort! This unit has a Queen size bed in one bedroom and bunk beds (2 twins) in the 2nd bedroom - room for a pack-n-play -in this bedroom PLUS full size sofa sleeper! Blankets & Pillows provided -you must bring your own linens, bath towels & kitchen towels for all rental time frames! Fully equipped kitchen with blender, toaster, coffeemaker, pot, pans, silverware, glassware, dishes! Outdoor chairs - 1 window A/C -32"Flat Sceen TV-charcoal grill - sandy beach area- this unit does not allow pets! You must bring charcoal- all paper products! Weekly Rate: $675 -$100 security deposit required to hold your week -rental amount due 60 days prior to your arrival date! 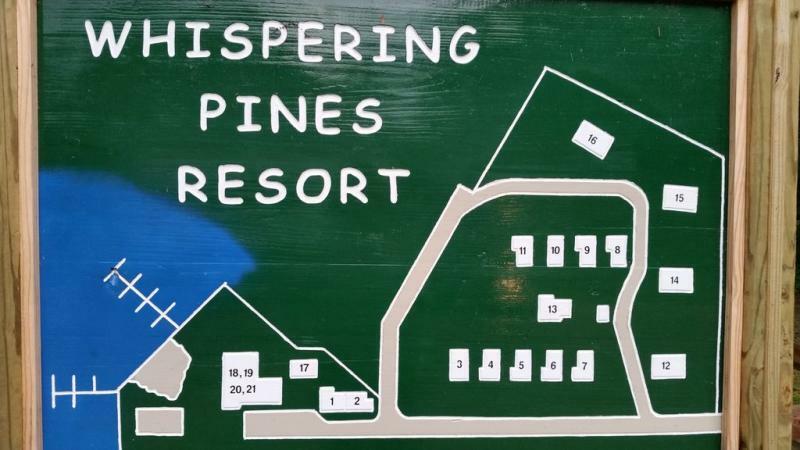 Whispering Pines Resort is made up of 21 units - with 202ft of lake frontage & beach area with beach volley ball court! 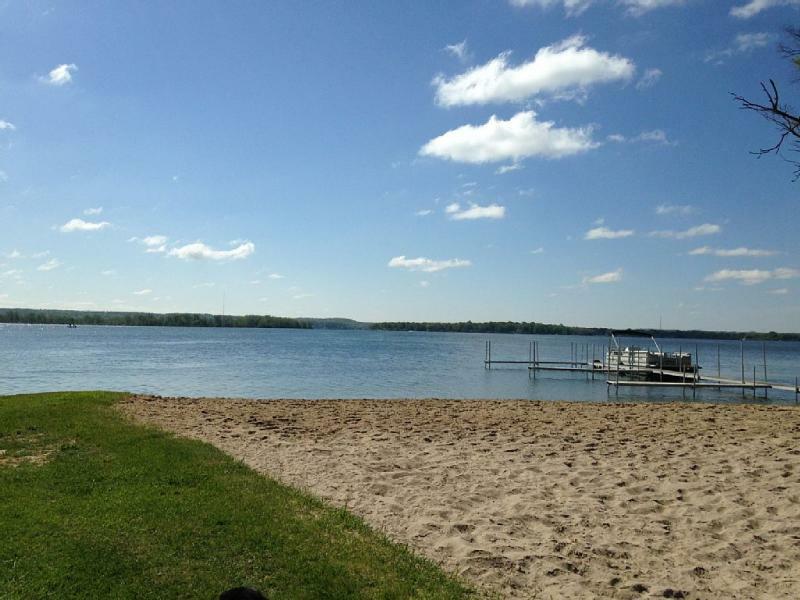 The resort does have play equipment - fish cleaning shed - docks for fishing only - swim area - fire pits on the beach and 2 at common area between the 2 rows of cottages & a sandy beach area! The resort does limit the number of cars each unit can have- that number is 2 - 1 boat slip per unit as well! Several Units are available in the resort for rent! Living room with full size sofa sleeper! Kitchen area with stove- mircowave and ref. Flat Screen TV will go here with antenna service only- there is no WiFi. Cottage #8- #9 & #10 should park on the grass @ your unit -off the road! ALL RENTAL TIMES REQUIRE $200 SECURITY DEPOSIT WHICH WILL BE REFUNDED WITHIN 15 DAYS OF YOUR DEPARTURE WITH ALL BEING LEFT IN GOOD SHAPE! Waterfrontage is common area-to be used by all 21 Units in the Resort.